Remember Meghan’s elaborate baby shower a few weeks back? I heard Serena Williams and Genevieve Hills co-hosted the “private, intimate” baby shower. Rumour has it Amal Clooney and Gayle King were there too. And it was held in Serena’s Grand Penthouse at The Mark in New York. Turns out there was a reason a very pregnant Meghan had to travel all the way to the Big Apple for the bash. Apparently, baby showers just aren’t a thing in the land of tea and crumpets. POPSUGAR explained that celebratory showers of any kind are simply not part of British customs. "This doesn’t mean Brits don’t give new moms gifts," they explained, "they simply offer them up after the baby is born." Either way, Meghan wasn't having any of it. And we heard she's planning a second shower at Buckingham Palace. In South Africa, a baby shower would include gift-sharing, food-eating and traditionally, dressing a very pregnant and uncomfortable grown woman up as a baby. We took a look at the way different cultures celebrate the impending arrival of a baby into a family. In India, most celebrations involve food, song and dance – baby showers are no different than here. 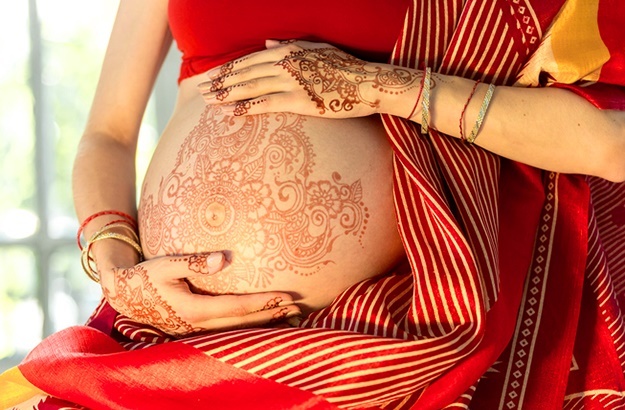 For one, a traditional Hindu baby shower known as Godh Bharai, meaning “fill the lap”, includes just that – a (usually) women-only ceremony in which relatives sing and dance while women fill her lap with gifts, fruits and sweets. There are also games involved with lots and lots of food too. Another tradition, practised among Indian families in South Africa too, is that of a roti in which the family gets together and each relative makes the mom-to-be her favourite foods. In southern India, there’s also the addition of the bangle ceremony in which women place bangles on the guest of honour, which can go all the way up to her elbows. Sometimes, the mom-to-be will keep them on until she gives birth, removing a bangle at a time to distract her from the pain of the contractions. In the Dominican Republic, family throws huge parties for both mom- and dad-to-be, inviting all the female and male relatives. It’s a massive event and yet somehow, kept a secret from the expectant parents. There’s food, gifts and dancing, but before any of that can commence, there’s a series of games for the guests to play. One includes filling bottles with juice – sometimes beer – for the guests to down, and the one who drinks it all up first, wins. Another game includes blindfolding guests who then have to feed each other. It’s a mess, of course, but it’s also a whole lot of fun. The French, much like the British, don’t usually have big baby showers. Instead, they wait until baby’s first birthday to have a huge party for the family. And both baby and mom get gifts! Korea has adapted pretty much the same approach as France, having a “doi” when the child turns 1 years old. The doi includes dressing baby in a traditional silk pouch to symbolise luck, with a colourful belt to represent longevity. Oftentimes, Korean parents also celebrate the 100-day mark because, in the past, many babies didn’t make it to the milestone with the high infant mortality rate. In China it’s considered unlucky to celebrate a baby before he or she is born. So as part of their full moon celebration, an event – usually a formal banquet dinner – is held after baby’s arrival. Guests arrive gift in hand, which usually comes in the form of a red envelope filled with money. Red is considered a lucky colour, one symbolising good fortune. In Tibet a pang-sai ("cleansing of the baby") is held three or four days after welcoming a new addition to the family. The latter also includes foods, gifts and the official naming of the baby. In Afghanistan, a celebration including a feast for the family and lots of gifts for the parents is held six nights after baby is born. The reasoning? The family can celebrate knowing baby is safe and healthy. And by then, the baby's gender has been confirmed and guests can bring appropriate gifts. How do you celebrate mom-to-be and baby-on-the-way in your family? What are some of your family's traditions? Tell us and we may add them to the list. Should you pay to attend a baby shower?